Running a WordPress site is hard work, so wouldn’t it be great if you could get a little help now and then? No, I’m not talking about hiring a human! I’m talking about harnessing artificial intelligence to improve your WordPress site without lifting one of your human fingers. Artificial intelligence is no longer the exclusive realm of Google and other billion-dollar tech companies – there are now some free or affordable WordPress plugins that let you add artificial intelligence to your very own website without requiring any special technical knowledge. 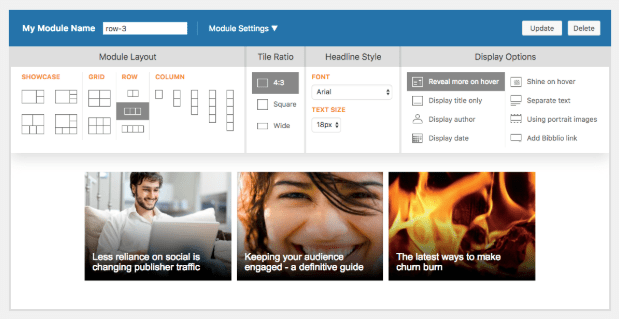 Better yet, these tools can actually make your WordPress site better, either in the form of improved user experience or just making it easier for you to manage your WordPress site’s content. In this post, you’re going to learn five actionable ways that you can use artificial intelligence to make a difference on your WordPress site. Let’s jump in before the singularity happens! 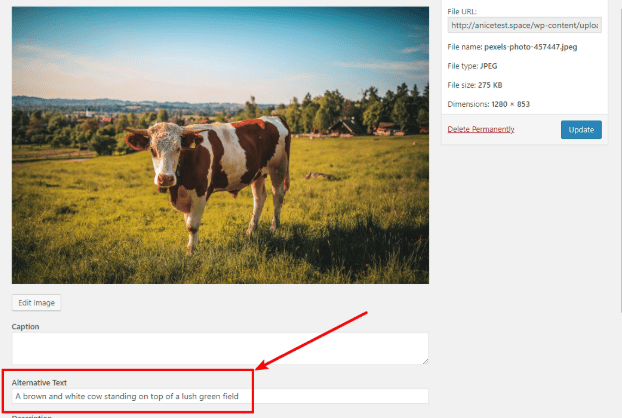 Image alt text lets you add a text description to all the images on your site. It helps to both make your site more accessible to users with screen readers, as well as boost your site’s SEO, especially when it comes to Google Image Search. Adding relevant alt text to all of your images is universally a good thing but it’s also an absolute pain to do, especially if you use a ton of images in your content. Automatic Alternative Text helps you leverage artificial intelligence to solve the problem. Basically, it taps into Microsoft’s Cognitive Services Computer Vision API to generate complete sentences of human-readable text. It’s not applying artificial intelligence in the plugin. Rather, Microsoft’s Cognitive Services Computer Vision service uses machine learning to generate accurate information about your images. To use it, you’ll need a Computer Vision API key (it’s free with a Microsoft Azure account). Once you have that, Automatic Alternative Text will automatically apply image alt text as long as the minimum confidence threshold is met (the default confidence threshold is 15%, but you can adjust it higher or lower). I’d say that’s pretty accurate! And what’s great is that it doesn’t just say “cow.” Instead, it forms a full sentence with real meaning. Related posts are a great way to draw readers deeper into your site, which can boost your site’s engagement and cut its bounce rate. But related posts only work if readers truly find them relevant and worth clicking on. Ok, probably not blowing your mind there – but the simple fact is that if you can get better related posts suggestions, you have a better chance at keeping readers around on your site. Big companies know that great content recommendations matter, which is why organizations like Netflix invest millions of dollars into using artificial intelligence to surface the best recommendations possible. Bibblio is a related posts plugin that lets you bring that same artificial intelligence approach to your WordPress site. Bibblio’s content recommendations are powered by machine learning, which helps them “learn” how to provide the most engaging suggestions possible. Intuitively, you know that the way you phrase things affects how people receive your ideas. But when you’re “in the trenches,” so to speak, it can be hard to see how your writing will come across to readers. 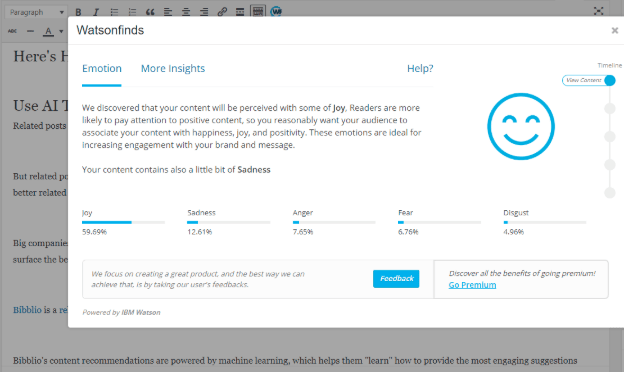 To make it easier to understand how most readers will perceive your content, Watsonfinds leverages artificial intelligence to analyze the likely emotions your visitors will feel as they read your content. Based on an analysis of the draft of this post, Watsonfinds thinks you’ll be experiencing joy while reading this. I hope that’s true! You already saw how artificial intelligence can help you display related content from your own site, but you can also use it to surface related content from other people’s sites that you can then curate and share with your readers. Curated content is a great way to fill out your publishing schedule and give your readers access to outside perspectives. But finding quality content that your visitors will want to read can quickly become a major time investment (trust me – it’s part of my job!). MyCurator can make your job easier by surfacing quality recommendations based on your unique preferences. Yes – you get to train it! 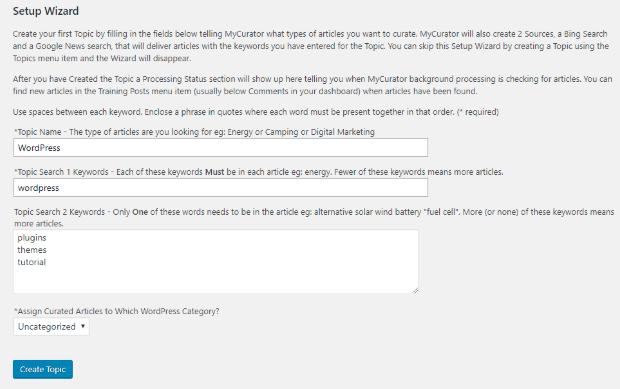 MyCurator learns to recommend better content based on how you rate articles (basically, you’re training it). Beyond the core recommendation engine, MyCurator also lets you automatically turn any article into a post with a pre-filled image, the attribution link, and an excerpt. This makes for super quick curation. You can’t be around 24/7 to chat with visitors to your website, but that doesn’t mean you have to leave your visitors to fend for themselves! Using chatbots, you can keep talking even when you’re away from the computer. Not all chatbots use artificial intelligence, and many of the chatbot plugins you see are really just a set of pre-programmed responses. But there are some quality options that do bring artificial intelligence into the equation. For example, Acobot Web Assistant uses conversational AI to chat with your visitors. And Acobot will actually learn over time to predict customer questions and answer them by itself. If you want a firsthand experience of how conversational AI works, check out the Acobot demo page. Acobot isn’t the only option, though. IBM Watson Assistant is another popular plugin that uses Watson to help you answer frequently asked questions from your visitors. And if you poke around, you’ll be able to find other services and plugins to help you implement an AI-powered chatbot on your WordPress site. Harness Artificial Intelligence For Your WordPress Site Today! If you’re a casual WordPress site owner, you might’ve viewed artificial intelligence as some out-there concept that only big brands with similarly big budgets can benefit from. But thanks to the developers behind these tools, there are some easy and affordable ways that all types of WordPress sites can benefit from artificial intelligence. Give some of these tools a try and let artificial intelligence improve your WordPress site! The post 5 Actionable Ways To Improve Your WordPress Site With Artificial Intelligence (AI) appeared first on Torque.